Holsters aren't the only way to hide your handgun. There are lots of ways to conceal the defensive handgun. In some situations, the author likes using a newspaper or file folder. Recently, my friend John Pepper (inventor of the Pepper Popper reactive steel target) sent me his observations on the advantage of having your hand on your defensive handgun when you think you might need it. Going past the obviousness of this, John's motivation for doing time trials is that he--along with many of us, including me--no longer can deliver a one-second draw from concealment on demand, if at all. Of course, this ability is already limited to those who practice doing so regularly, but I've lost count of how many gun handlers (particularly lawmen) I've met who, while only in their late 40s and early 50s, have permanent shoulder damage. 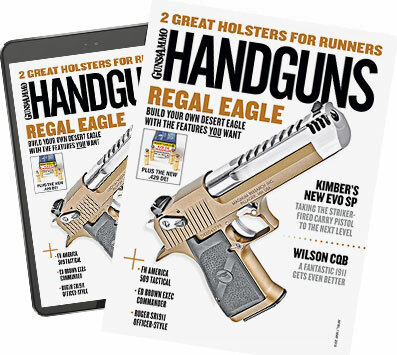 The huge negative to having your hand on your concealed handgun is this can be viewed as a "menacing" act, a chargeable criminal act under various laws. However, this can be avoided if you give some thought to how you carry and conceal your gun. The "shopkeeper carry" is an old but still effective alternative. When moving to and from their place of business, particularly when going to make a bank deposit, shopkeepers have long simply stuffed their handgun in the same paper bag as their bank deposit. From what I've observed, their decision to have the bag open or closed was dictated by the threat level of the locale. I regret I did not have the opportunity to question them as to how they intended to fire their guns. The easiest thing to do is carry the bag in your off hand. If you run into a questionable situation, simply stick your gun hand into the bag. If a real threat develops, you can actually fire the gun from inside the bag. An alternative method is to have the handgun beneath the bag, but this doesn't, in my experience, hide the gun all that well. The better "cover" is a magazine or newspaper. I found myself using a file folder when serving warrants. I'd knock on the door with gun and file folder in my off-hand, pinching the folder and my S&W Model 42 hammerless Airweight revolver together. With practice, I got to the point I could not only open the folder to display the warrant or photos, I could make notes in it and still have a gun in hand. Fortunately for me, the only use I ever had to make of the gun from this position was to reveal it, but right from the beginning I made a great effort to not point the gun at anyone and to keep my finger off the trigger--techniques quickly validated with my first slip and fall from an ice-covered front step. I came to like this method more than pocket carry because it is faster, and I also saw it was both more natural looking and also gave me a wider field of fire more quickly. As to the mechanics of firing from a bag or from beneath a newspaper, simply point and shoot. If you feel the need for more accuracy, just let the bag or newspaper fall. Obviously, I prefer a small revolver for this, since I'm certain I can get more than one shot off without a malfunction. A semiauto will give me one shot, but the ejected case can be bounced back into the gun's action, particularly if it's held in your left hand. If you have to or want to use a semiauto, some range work is necessary because it's not only the type of gun but also the type of ammo that affects the ejection pattern. And the auto pistol should be double-action for the first shot--otherwise you are either fumbling to get the thumb safety off or run with the manual safety off, which is not normally a good thing. The size of the gun didn't matter in my experience, save for when I wanted to put it away since the bigger one was, naturally, a bit harder to move discreetly. I've used the paper bag carry only a few times, with an equal amount of limited practice and, while it does work--I can shoot and get hits--I like the gun more exposed. The file folder/newspaper approach is also faster to use when, say, answering a knock at a motel room door when you're not expecting anyone and you may be only partially dressed. With the gun under cover, so to speak, it's also easy to put it down on a nearby table but still have it close and available for instant use with no one the wiser. As with any gun handling and shooting technique, a good, solid practice session is most definitely recommended; do so with the gun in either hand. After this, you should not need more than an annual tune-up. One cautionary note: The above techniques are not unknown to the bad guys, as I was reminded by a lawman who had read my discussion of this in my first book, Real World Survival! What Has Worked For Me, where I had a photo of me with a newspaper and gun answering my front door. He thanked me and said he thought I might have saved his life by including this, as he remembered it when he responded to a family disturbance call and a man answered his knock by opening the front door with newspaper in hand. The officer made him drop it. (The man having a bit of blood spattered on him was a clue that something was wrong.) He did and the newspaper was concealing the murder weapon with which the man had just killed his wife: a long-bladed kitchen knife.